It has corset lacing in the front and back. It also has shirring in the back that can maybe make it a little bit bigger. It's not an actual skirt it's an over skirt that you wear over a dress or skirt. It's made out of wrinkly cotton material. I will iron it before mailing, but because I ship in envelopes it might wrinkle in the mail. 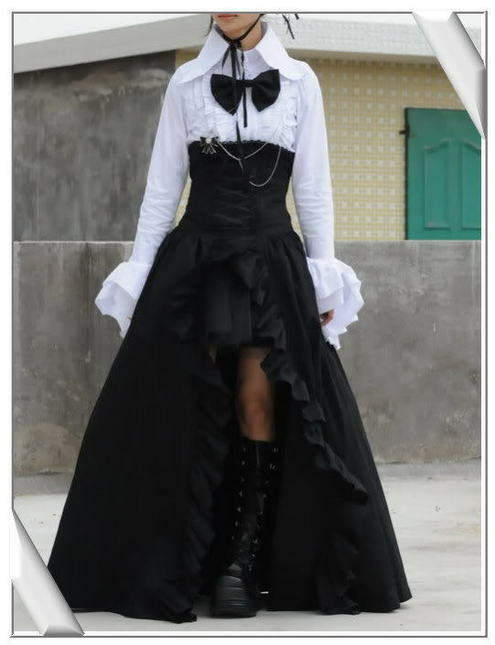 Stock pics are shown, only underskirt is available, other items are not. The corset part in the back can be adjusted and taken out/adjusted to make the shirring larger/smaller. 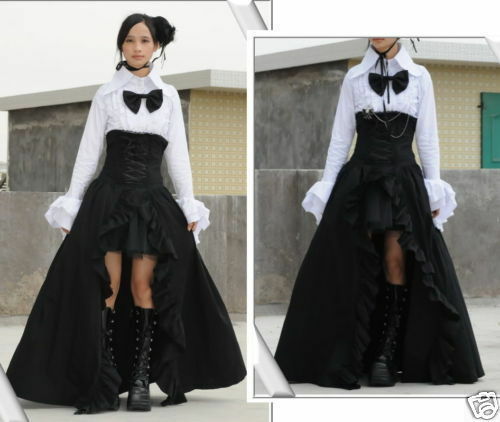 The corset in the front cannot make the skirt bigger. There's a side zipper that can be unzipped fully for easy of taking on and off. The corset lacing in the back has been unlaced partially in my photos, but the lacing is fully there and can be laced fully. The quality really nice and thick. I love the way it looks, but I cannot continue to hang onto things that are too small for me. All packages go out 2-3 days after payment has cleared. Holidays and post office closings may prevent me from being prompt and I ask for you to be patient especially during December :) Larger items, dresses/bags, brand items will only ship priority! Due to past experiences I will not ship untracked or not priority. Absolutely no exceptions! I do not ship international. It's not an option at the moment after many times trying. Prices are in USD, You will be invoiced in USD No trades at all, please don't ask. Please message me after auction is over. You have 24 hours to send a message. If not item will be relisted and negative feedback will be left. Feedback left when the transactions are complete. Please pay within 24 hours, send me a message if you need some extra time before buying the auction. I try to let people know of anything wrong with the items to the best of my ability. If something is wrong please contact me before leaving bad feedback. Contact me here and not through paypal. I try to list things accurately, but I am only human and may miss stuff. I don't try to intentionally miss stuff. If there was a mistake or you're unhappy please contact me before doing anything else. Thanks! A lot of my items have been crosslisted to ebay or facebook sales keep that in mind if you buy something here first. It's never happened that two people buy my items at the same time, but keep it in mind in case it ever happens. Speaking of ebay, priority goes to whoever buys the listing first. Most of my items have been listed to ebay and there's always a chance someone buys my auction there first. If we've been discussing an item here, the priority goes to LM. I do holds with at least %20 non refundable deposit before hand. You must message me before buying or bidding if you need a hold. I don't like payment plans but if you had one in mind message me before buying the auction. I don't accept long payment plans. Must have good feedback concerning payment plans if you want one. No refunds, no trades, no exchanges. Please make sure your measurements are accurate and that you read the descriptions accurately before buying. When buying the auction you have agreed to my terms and conditions and I assume you're alright with anything that has damage or is very used. Offers accepted, haggling welcome, but please do not lowball. Don't be scared to make an offer if you're interested. Feel free to make an offer on anything, but please by fair. Send me a message if you want to make an offer. I only ship to address that's on your paypal I will not ship it anywhere else. Please check to make sure it's the right address before paying the invoice. My room mates have animals... however, they are not allowed in my room let alone my closet. The animals won't ever touch my things. I do not interact with their animals at all either... but if you're sensitive to things like this please keep it in mind. They have 2 cats, 2 dogs, 2 birds. I sometimes interact with one of their cats, be aware when buying anything. She is not allowed in my room where my items are stored and I try not to interact with her when i've worn said items. I have the right to deny a sale based on your feedback or any other reason I deem is problematic. I reserve the right to not to sell to anyone of my choice. Please message me if you have no feedback before buying one of my auctions. Any questions or concerns please send me a message, and please don't leave a comment. I might not see the comments on the auction(s) I do offer combined shipping and am willing to make a deal if you're interested in more than one item i'm selling. Send me a message if you're interested :) Thank you!